To the delight of many, the bridge now under construction across the spectacular spillway of the New Croton Dam will resemble the well-loved 1905 original, whose image has graced so many postcards, photographs, and paintings. Helen Barolini of Hastings greeted the news with pleasure, saying "a return to a more traditional design is something we long hoped would happen." Physical deterioration of the 1905 bridge from roadway salt and spillway spray led in 1975 to a replacement bridge of more modern design. Now, structural problems in the 1975 bridge have required its replacement. 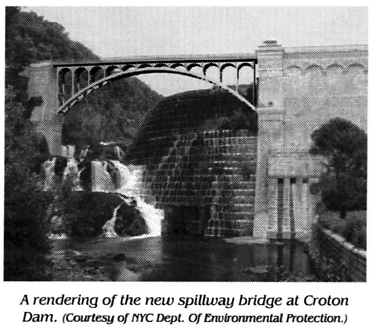 The year 1905 brought a new addition to the rising dam: the 200-foot arched [spillway] bridge, for which the New Croton Dam was famous ... The span was a graceful structure against the backdrop of the jagged gorge . .. . Because of concern for its structural integrity, the old span was replaced with a modern, simple bridge that has never caught the attention of dam aficionados as well as the old bridge did." The original, 1892 contract for the dam showed only the notation "bridge" for the spillway bridge on its drawings, without a specific design. One early report showed it as a through-truss steel bridge (see illustration). Discussions followed about what the bridge should like look and whether it should be granite (more durable, more expensive) or steel. The decision was for a steel arch bridge. The current decision by the New York City Department of Environmental Protection, which has jurisdiction over the dam, to create a contemporary version of the original span was influenced by the dam's classical design and powerful presence, as well as the character of the surrounding landscape. DEP, working with the New York State Historic Preservation Office and the city's Art Commission, together with the bridge engineering firm of Hardesty & Hanover, developed a design intended to integrate the dam, the bridge, and the natural surroundings. There are differences between the 1905 bridge and the new design. Twelve columns, equally paced to echo the detailing along most of the dam's face, will fill the spandrels - the two triangular space between the top deck of the bridge and the outer curves of its wide arch over the Croton River; the 1905 bridge had 18 of the vertical elements, with varied spacing between them. While the 1905 bridge was black and the 1975 pan was a weathered dark brown, the new bridge will be silver-gray in color to blend with the masonry of the dam. To eliminate painting and reduce maintenance costs, the final finish will be obtained through a process called metallizing. Less visible will be such improvements as a higher load capacity, stainless steel reinforcements, and seismic constraints. In both the 1905 and the new bridge, the spandrel column transfer load from the deck level down to and along the arch over the river, whereas the 1975 bridge had most loads concentrated at the center - it looked like an arch but could truly not function as one, according to the current bridge engineer. In both the 1905 and new bridge, the narrow "arches" between the tops of spandrel columns serve a decorative purpose only.